The prevention of coronary artery disease (CAD) requires identification of clinically asymptomatic individuals at risk of developing CAD so that intensive preventive measures may be instituted to arrest the disease progression. The presence of modifiable risk factors cannot always be interpreted as the presence of atherosclerotic heart diseases nor their absence guarantees atherosclerotic lesion-free arterial tree. Population-based screening tools that assign a risk probability, such as the Framingham risk score, are effective in assigning risk to populations but are limited in their ability to characterize the risk for a particular individual. This problem becomes particularly important in patients judged to be at intermediate cardiovascular (CV) risk, for example, patients with atypical symptoms and positive treadmill test or patients with suggestive symptoms but negative stress test. In any situation, coronary angiography is the gold standard, but it is costly and also invasive. Ankle–brachial pressure index (ABI) and carotid intima-media thickness (CIMT) are simple noninvasive tests which have been studied in the past for identifying CAD. However, studies done in the Western population and a few studies in Indian population regarding the use of CIMT and ABI in suspected CAD have yielded mixed results with varying predictive values.,,,,,, In this first-ever study in Northeast India, we tried to investigate the predictive values and the strength of correlation of CIMT and ABI with the presence and extent of significant coronary artery narrowing regarding number of coronaries involved in patients of suspected CAD evaluated by coronary angiography. The present study also aimed at investigating whether studying ratio of ABI and CIMT has any incremental value in predicting CAD than either of them, a question not addressed by most of the studies on the subject. In this prospective observational study, 235 cases from June 2014 to July 2015 attending Cardiology Outpatient Department of Gauhati Medical College, Assam, were taken. Patients suspected of having CAD on the basis of anginal symptoms or atypical chest pain with positive stress test, who were scheduled to undergo diagnostic coronary angiography, were included in the study. Patients of acute coronary syndromes, prior coronary artery bypass surgery or percutaneous transluminal coronary angioplasty, vasculitis, cardiomyopathy and known cases of peripheral artery disease, claudication, or stroke were excluded from the study. All the patients underwent clinical evaluation, necessary biochemical tests, electrocardiogram (ECG), and transthoracic echocardiography. The baseline clinical characteristics that were analyzed included the age, gender, hypertension (blood pressure >140/90 mmHg and/or those already taking treatment for hypertension), diabetes mellitus (fasting blood glucose >126 mg/dL and/or postprandial blood glucose >200 mg/dL and those who were on treatment for diabetes mellitus), smoking status, and dyslipidemia; TC ≥200 mg/dl (5.16 mmol/L) or low-density lipoprotein >130 mg/dl (3.38 mmol/L) or low-density lipoprotein cholesterol <40 mg/dl (1.03 mmol/L) or TG ≥150 mg/dl (3.87 mmol/L). All the patients underwent ABI and CIMT measurements followed by coronary angiography. CIMT measurements were obtained with the patient lying in the supine position and the neck rotated to opposite side. After transversely scanning the common carotid artery from the base of the neck to the carotid bulb, longitudinal images were taken to obtain the best lumen-intima interface. CIMT was the distance between the leading edges of lumen-intima interface and media-adventitia interface measured in the far wall of the common carotid artery around 1 cm below the carotid bulb using electronic calipers manually., It was done in plaque-free region according to the guidelines recommendations at end diastole corresponding to the peak of R wave in ECG. Carotid plaque is defined as a localized thickening of more than 1.5 mm in the intima of the artery., The measurements were done using B-mode Siemens Ultrasound Machine with a 5–10 MHz linear phase array transducer. CIMT was assessed on both sides of the neck and six values of CIMT (three on each side) are obtained and averaged to get mean CIMT. The patients then underwent the planned invasive coronary angiography using Judkins method by a cardiologist who was unaware of the ABI and CIMT values. According to the results of the coronary angiography, patients with >50% luminal diameter stenosis in one of the major coronary arteries left anterior descending, left circumflex, right coronary artery, or left main coronary artery were termed as the CAD group. The rest of the patients, having <50% luminal diameter stenosis, were classified as the non-CAD group. The CAD group was further divided depending on the number of major coronary vessels involved into single-vessel disease (SVD) group, double-vessel disease (DVD) group, and severe CAD, that is, triple-vessel disease/left main (TVD/LM) group. The groups were compared regarding risk factors, CIMT, and ABI. Values were expressed as means and standard deviation. Student's unpaired t-test was used to determine significant differences among continuous variables, while Fisher's exact test was used for categorical variables. ANOVA was used to compare the means among multiple groups. The differences were considered significant if P < 0.05. If the difference in the mean values among multiple groups was significant, the Turkey's test was further used. Statistical analysis was performed using the online statistical calculator, www.graphpad.com/. The mean age of the study population was 56.32 ± 10.14 years. Out of the total 235 patients, 190 (80.85%) were males and 45 (19.15%) were females. Patients were divided into CAD group (130 patients) and nonCAD group (105 patients), depending on the results of CAG. Among the nonCAD group, 60 patients had insignificant disease on angiography. The CAD group was further divided into three groups depending on severity, SVD group (56 patients), DVD group (33 patients), and TVD/LM disease group (41 patients). The mean age of CAD patients was higher than that of nonCAD patients (P = 0.0152). In CAD group, the maletofemale ratio was higher (6.22:1) compared to nonCAD group (2.88:1). Diabetes mellitus, hypertension, dyslipidemia, and smoking were present in 79 (33.6%), 114 (48.5%), 80 (34.04%), and 116 (49.3%) of the patients, respectively. The CAD group had significantly higher prevalence of diabetes mellitus (P = 0.005), hypertension (P = 0.048), and dyslipidemia (P = 0.018) compared to nonCAD group [Table 1]. Mean of the maximum CIMT in the total study population was 0.802 ± 0.229 mm. CIMT was significantly higher in the CAD group compared to non-CAD group (0.91 ± 0.220 vs. 0.66 ± 0.15, P ≤ 0.0001) [Table 2]. Among the CAD patients, significant differences were observed in CIMT between patients with SVD and DVD (0.78 ± 0.17 vs. 0.98 ± 0.19; P ≤ 0.001) as well as between SVD and TVD groups (0.78 ± 0.17 vs. 1.01 ± 0.23; P = 0.001). The difference between DVD and TVD groups was not statistically significant (P = 0.56). As there was no established cutoff for CIMT and as this cutoff value varied among the different studies conducted across different patient populations in different regions of the world, so we analyzed our data by receiver operator characteristics (ROC) curve to find a cutoff with optimal predictive values in our study population. We got a strong ROC curve with area of 0.813 for CIMT in predicting CAD. As per the ROC curve analysis, at an optimal cutoff value of ≥0.75 mm, the sensitivity and specificity of CIMT to predict CAD was found to be 72.3% and 79%, respectively. The data were further analyzed taking CIMT value of ≥0.75 as a positive test. The sensitivity, specificity, and positive and negative predictive values of CIMT of ≥0.75 for predicting CAD were 72.3%, 79.04%, 81.03%, and 69.94%, respectively [Table 3]. Analyzing the predictive values of CIMT of ≥0.75 for TVD/LM disease, sensitivity, specificity, positive predictive value, and negative predictive value of 87.80%, 58.76%, 31.03%, and 95.79% were obtained, respectively. A high negative predictive value suggests that a CIMT of <0.75 was valuable in ruling out severe CAD in the form of TVD or LM artery disease in this study population. The mean ABI in the study population was 1.121 ± 0.18. The mean ABI was significantly lower in the CAD group compared to non-CAD group (1.07 ± 0.19 vs. 1.18 ± 0.14, P ≤ 0.0001). Among the CAD patients, TVD patients had a lower ABI than SVD patients (0.98 ± 0.17 vs. 1.12 ± 0.18, P ≤ 0.001). The difference was not significant between SVD and DVD groups (1.12 ± 0.18 vs. 1.07 ± 0.19, P > 0.05) as well as between DVD and TVD/LM groups (1.07 ± 0.19 vs. 0.98 ± 0.17, P > 0.05). At an established cutoff value of ABI ≤0.9, the sensitivity, specificity, positive predictive value, and negative predictive value to predict CAD were 21.53%, 96.19%, 87.5%, and 49.75%, respectively [Table 4]. Hence, though ABI of ≤0.9 had a low sensitivity to predict CAD, a high specificity shows that if ABI is ≤0.9, there is a very high likelihood of having CAD in our patient population of suspected CAD. The curve analysis showed that at ABI cutoff of ≤1, sensitivity to predict CAD was 38.5% and the specificity was 85.7%. As the cutoff value increases, the sensitivity improved but the specificity falls. ABI/CIMT ratio had a stronger ROC curve with area under the curve of 0.83; stronger against either CIMT or ABI with a curve area of 0.813 and 0.673, respectively. At a cutoff of ABI/CIMT ratio of ≤1.55, sensitivity and specificity of 75.4% and 78.1%, respectively, were obtained to predict CAD. At a slightly higher cutoff of ABI/CIMT ratio of ≤1.6, sensitivity and specificity of 77.7% and 71.5% were obtained, respectively. A better sensitivity was obtained at higher cutoff values of ABI/CIMT ratio but at the cost of decreasing specificity. Linear regression analysis showed that increasing value of CIMT strongly correlated with the severity of CAD (R = 0.40, P ≤ 0.001). It showed a significant but weak correlation of decreasing ABI with severity of CAD (R = 0.22, P < 0.001). The correlation was still stronger using ABI/CIMT ratio (R = 0.44, P ≤ 0.001). This showed that there was incremental value in studying both ABI and CIMT in predicting CAD than either of them. Multiple logistic regression analysis was done to find out whether ABI and CIMT could predict the presence of CAD independently in the presence of different risk factors. It showed that CIMT was the strongest independent predictor of CAD (P < 0.0001) followed by ABI (P = 0.006) [Table 5]. In this first-ever study in Northeast India, we tried to investigate the predictive values and the strength of correlation of CIMT and ABI with the presence and extent of CAD evaluated by coronary angiography. The present study also aimed at investigating whether studying ratio of ABI and CIMT and has any incremental value in predicting CAD than either of them, a question not addressed by most of the studies on the subject. The mean of maximum CIMT in our study population was 0.802 ± 0.229 mm. In a study by Kasliwal et al., mean CIMT in the Indian population was found to be 0.608 ± 0.12 mm in men versus 0.579 ± 0.11 mm in women, which is lower than our study population. This is expected as our study population included 130 patients with significant CAD, whereas Kasliwal et al. have calculated mean CIMT in the general Indian population without significant CAD. However, in our study, in non-CAD group mean CIMT was 0.669, which is comparable to study by Kasliwal et al. In our study, the mean maximum CIMT value of 0.910 mm in CAD group was found to be significantly higher than mean maximum CIMT (0.669 mm) in non-CAD group (P < 0.001). In a similar study population of suspected CAD, Hansa et al., Granér et al., and Tarzamni, et al., in their respective studies, found similar significantly higher mean maximum CIMT in CAD group compared to non-CAD group. Furthermore, in South Indian study by Ezhumalai et al., mean CIMT was higher in CAD group (0.74 mm) than non-CAD group (0.45 mm). In our study, the mean of maximum CIMT in SVD, DVD, and TVD/LM groups was 0.78 ± 0.17, 0.98 ± 0.19, and 1.01 ± 0.23, respectively. Furthermore, comparison between groups found that mean maximum CIMT is significantly higher in DVD or TVD/LM group compared to SVD group or non-CAD group (P = 0.001). Similar finding of increasing CIMT with increasing coronary involvement was found by Kablak-Ziembicka et al. and Tarzamni et al. from Iran. They showed that patients with DVD and TVD had significantly higher CIMT than patients without CAD. In our study, we analyzed our CIMT data by ROC curve to find a cutoff with optimal predictive values in our study population. We got a cutoff value of 0.75 mm above which sensitivity, specificity, and positive and negative predictive values for predicting CAD was 72.3%, 79.04%, 81.03%, and 69.94%, respectively. Djaberi et al., in their study, obtained on optimal sensitivity and specificity of 85% and 72%, respectively, at a cutoff of 0.67 mm by ROC curve analysis. Matsushima et al. in their study, obtained a sensitivity of 70% and specificity 69% while taking a higher cutoff of 1.2 mm according to the ROC curve analysis. In few studies such as Coskun et al. and Jadhav et al., arbitrary cutoff values of 1 mm and 0.8 mm were taken, respectively. The variability in the cutoff value of CIMT in different studies may also be related to the ethnically and geographically different populations studied. Hence, the value obtained in our study could be more appropriate for the Northeast Indian population studied. In our study, a higher sensitivity (87.8%) and negative predictive values (95.79%) for TVD or left main artery disease suggests that CIMT <0.75 was valuable in ruling out these forms of severe CAD. Kasliwal et al. in their study of CIMT for predicting LM coronary disease in CAD patients got a cutoff value of 0.87 mm for maximum CIMT. They found sensitivity of 90% and specificity of 64% in predicting LM disease at this cutoff, a finding helpful to rule out severe CAD as in our study. Linear regression analysis showed a significant correlation between CIMT and number of involved coronaries with the R = 0.402 (P ≤ 0.001) in our study. By linear regression analysis, Hansa et al. and Matsushima et al. also found similar correlation of mean maximum CIMT with CAD (R = 0.28 and R = 0.411, respectively). Even Kablak-Ziembicka et al. and Granér et al. also found a significant linear correlation between CIMT and advancing CAD, while Adams et al. showed a weak correlation. However, only few studies have investigated the role of ABI in predicting CAD in suspected patients. The results of these studies too are very discrepant; a study by Matsushima et al. showing no correlation between ABI and CAD, while another study showed a very strong correlation. The study by Su et al. showed a low sensitivity, while a study by Ezhumalai et al. showed a very high sensitivity. The mean ABI in our study population was 1.121. The mean ABI (1.070) in CAD group was found significantly lower than mean ABI (1.183) in non-CAD group (P < 0.001). Similar findings were found in the study by Ezhumalai et al. and Sadeghi et al. As found in these studies, among the CAD patients in our study, TVD patients had a lower ABI than SVD patients. In our study, at an established cutoff ABI ≤0.9, sensitivity, specificity, and positive and negative predictive values of 21.53%, 96.19%, 87.5%, and 49.75% were obtained, respectively. A low sensitivity was seen as most patients of SVD and DVD did not have low ABI. A systemic study meta-analysis by Doobay et al. concluded that low ABI had high specificity in predicting CAD (92.7%); whereas, its sensitivity in doing so was only 16.5%. Furthermore, in the study by Su et al., the sensitivity, specificity, positive predictive value, and negative predictive value of 22%, 46%, 93%, and 34% were obtained, respectively. A consistent finding in all these studies is low sensitivity but high specificity of ABI. Linear regression analysis showed a significant but weaker correlation between ABI and the number of diseased coronaries (R = 0.22, P < 0.001). Similar correlation by linear regression was shown between lower ABI and severity of CAD by Park et al. and Sadeghi et al. (P ≤ 0.001). However, in the study of Matsushima et al., ABI did not correlate with the severity of CAD (Gensini score) as against CIMT, which strongly correlated with the Gensini score. In our study, although significant correlation of ABI with severity of CAD has been seen, this correlation is weaker (R = 0.22) compared to the correlation of CIMT with CAD (R = 0.402). In our study, the correlation as well as the predictive value of the ABI/CIMT ratio by ROC curve analysis with the number of coronaries involved was stronger compared to either of the two. At a cutoff of ABI/CIMT ratio of ≤1.55, a sensitivity of 75.4% and specificity of 78.1% was obtained. Our study predicted an incremental value in studying the ratio of ABI and CIMT in predicting CAD than either of them. In a study by Hayashi et al., they found that prevalence of CAD, based on history of prior MI or angioplasty, was significantly higher in patients with an abnormal ABI/CIMT score than presence of either low ABI or high CIMT. In our study, CIMT was the strongest factor which independently predicted CAD (P ≤ 0.001) followed by ABI (P = 0.006). Other factors such as age, gender, diabetes mellitus, hypertension, dyslipidemia, or smoking did not independently predict CAD. Among studies done on CIMT to predict CAD, the study by Hansa et al., only maximum CIMT was found to be the independent predictor of CAD, while no other risk factor had independent predictive value. The study by Djaberi et al. and Coskun et al. also showed CIMT to be an independent predictor of CAD by multivariate analysis. In a study of ABI for the prediction of CAD, Otah et al. found it to be an independent predictor of CAD. A few studies have studied both ABI and CIMT for the prediction of CAD. Among them, Ezhumalai et al. got positive results for both ABI and CIMT in predicting CAD although logistic regression was not a part of that study. However, in the study by Matsushima et al., CIMT was found to be an independent predictor of CAD but not ABI. This was a single-center study and lacked the follow-up data, so the prognosis of patients based on ABI and CIMT values was not studied. In patients with suspected CAD, both CIMT and ABI are simple and noninvasive tools to predict the presence of CAD. Both CIMT and ABI significantly correlated with the severity of CAD, with respect to the number of coronaries involved. Among these two, CIMT has better predictive value and stronger correlation with CAD. Studying the ratio of ABI and CIMT has an incremental value in predicting CAD than either of them. Magnus P, Beaglehole R. The real contribution of the major risk factors to the coronary epidemics: Time to end the “only-50%” myth. Arch Intern Med 2001;161:2657-60. Greenland P, Gaziano JM. Clinical practice. Selecting asymptomatic patients for coronary computed tomography or electrocardiographic exercise testing. N Engl J Med 2003;349:465-73. Sadeghi M, Tavasoli A, Roohafza H, Sarrafzadegan N. The relationship between ankle-brachial index and number of involved coronaries in patients with stable angina. ARYA Atheroscler 2010;6:6-10. Ezhumalai B, Krishnasuri SD, Jayaraman B. 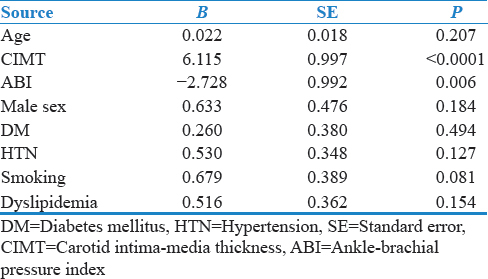 Comparison of diagnostic utilities of ankle-brachial index and carotid intima-media thickness as surrogate markers of significant coronary atherosclerosis in Indians. Indian Heart J 2013;65:137-41. Kablak-Ziembicka A, Tracz W, Przewlocki T, Pieniazek P, Sokolowski A, Konieczynska M, et al. Association of increased carotid intima-media thickness with the extent of coronary artery disease. Heart 2004;90:1286-90. Granér M, Varpula M, Kahri J, Salonen RM, Nyyssönen K, Nieminen MS, et al. Association of carotid intima-media thickness with angiographic severity and extent of coronary artery disease. Am J Cardiol 2006;97:624-9. Djaberi R, Schuijf JD, de Koning EJ, Rabelink TJ, Smit JW, Kroft LJ, et al. Usefulness of carotid intima-media thickness in patients with diabetes mellitus as a predictor of coronary artery disease. Am J Cardiol 2009;104:1041-6. Matsushima Y, Kawano H, Koide Y, Baba T, Toda G, Seto S, et al. Relationship of carotid intima-media thickness, pulse wave velocity, and ankle brachial index to the severity of coronary artery atherosclerosis. Clin Cardiol 2004;27:629-34. Adams MR, Nakagomi A, Keech A, Robinson J, McCredie R, Bailey BP, et al. Carotid intima-media thickness is only weakly correlated with the extent and severity of coronary artery disease. Circulation 1995;92:2127-34. Coskun U, Yildiz A, Esen OB, Baskurt M, Cakar MA, Kilickesmez KO, et al. Relationship between carotid intima-media thickness and coronary angiographic findings: A prospective study. Cardiovasc Ultrasound 2009;7:59. Stein JH, Korcarz CE, Hurst RT, Lonn E, Kendall CB, Mohler ER, et al. Use of carotid ultrasound to identify subclinical vascular disease and evaluate cardiovascular disease risk: A consensus statement from the American Society of Echocardiography Carotid Intima-Media Thickness Task Force. Endorsed by the Society for Vascular Medicine. J Am Soc Echocardiogr 2008;21:93-111. Kasliwal RR, Bansal M, Gupta H, Agrawal S. Association of carotid intima-media thickness with left main coronary artery disease. Indian Heart J 2007;59:50-5. Jadhav UM, Kadam NN. Carotid intima-media thickness as an independent predictor of coronary artery disease. Indian Heart J 2001;53:458-62. Pickering TG, Hall JE, Appel LJ, Falkner BE, Graves J, Hill MN, et al. Recommendations for blood pressure measurement in humans and experimental animals: Part 1: Blood pressure measurement in humans: A statement for professionals from the Subcommittee of Professional and Public Education of the American Heart Association Council on High Blood Pressure Research. Hypertension 2005;45:142-61. Aboyans V, Criqui MH, Abraham P, Allison MA, Creager MA, Diehm C, et al. Measurement and interpretation of the ankle-brachial index: A scientific statement from the American Heart Association. Circulation 2012;126:2890-909. Su HM, Voon WC, Lin TH, Lee KT, Chu CS, Lee MY, et al. Ankle-brachial pressure index measured using an automated oscillometric method as a predictor of the severity of coronary atherosclerosis in patients with coronary artery disease. Kaohsiung J Med Sci 2004;20:268-72. Kasliwal RR, Bansal M, Desai N, Kotak B, Raza A, Vasnawala H, et al. A study to derive distribution of carotid intima-media thickness and to determine its COrrelation with cardiovascular risk factors in asymptomatic nationwidE Indian population (SCORE-India). Indian Heart J 2016;68:821-7. Hansa G, Bhargava K, Bansal M, Tandon S, Kasliwal RR. Carotid intima-media thickness and coronary artery disease: An Indian perspective. Asian Cardiovasc Thorac Ann 2003;11:217-21. Tarzamni MK, Salehi R, Givian F, Farhang S. Association of carotid intima-media thickness with the presence and severity of coronary artery disease. Neurosciences (Riyadh) 2006;11:308-11. O'Hare AM, Katz R, Shlipak MG, Cushman M, Newman AB. Mortality and cardiovascular risk across the ankle-arm index spectrum: Results from the cardiovascular health study. Circulation 2006;113:388-93. Ankle Brachial Index Collaboration, Fowkes FG, Murray GD, Butcher I, Heald CL, Lee RJ, et al. Ankle brachial index combined with Framingham risk score to predict cardiovascular events and mortality: A meta-analysis. JAMA 2008;300:197-208. Doobay AV, Anand SS. Sensitivity and specificity of the ankle-brachial index to predict future cardiovascular outcomes: A systematic review. Arterioscler Thromb Vasc Biol 2005;25:1463-9. Park YK. Association between the AnkleBrachial Index and the Severity of Coronary Artery Disease. Available from: http:// www.jacc.tctabstracts2012.com. [Last accessed 2013 Jan]. Hayashi C, Ogawa O, Kubo S, Mitsuhashi N, Onuma T, Kawamori R, et al. Ankle brachial pressure index and carotid intima-media thickness as atherosclerosis markers in Japanese diabetics. Diabetes Res Clin Pract 2004;66:269-75. Otah KE, Madan A, Otah E, Badero O, Clark LT, Salifu MO, et al. Usefulness of an abnormal ankle-brachial index to predict presence of coronary artery disease in African-Americans. Am J Cardiol 2004;93:481-3.